The rise in the stock markets and the increased value of housing have pushed the market value of assets owned by all U.S. households to a record $99 trillion at the end of March, according to a report released by the Federal Reserve on Thursday. Thank the fed for doing a good job; thank high-IQ, web 2.0, and American exceptionalism; thank the economic contributions of America’s best and brightest; thank the meritocracy, foreign investment, real estate, free market capitalism – and even a nod to George W. Bush. But the middle class — whose wealth consists mostly of the equity they have in the house they live in — hasn’t been left out entirely. Since 2009, the value of homeowners’ equity has risen by $5.5 trillion, or 90%. Real estate is a great way to build wealth. My home keeps going up everyday where I live. No great stagnation, as much as the left insists the economy is weak and America is in decline. This is the greatest wealth boom in the history of the world, and it will only continue. Snapchat will soon be valued at $15-20 billion, Uber at $30-50 billion, Pinterest at $15 billion, Tinder at $10 billion, AirBNB at $40 billion, and so on… Just two or three of these companies will be equal to one Disney or a McDonald’s, but still not a bubble. The left said Facebook was a bubble at $15 billion back in 2007. Now it’s worth $190 billion. Those valuations will keep going up…bank on it. A smaller share of the nation’s total income has been going to wages and salaries, and more to profits and income from assets owned. From the 1970s through the early 2000s, workers received around 65% of national income in compensation, but after the financial crisis their share fell to below 61%. Of course, the lion’s share of that wealth is owned by a comparative few: just over 1% of Americans own half of that $84.9 trillion, most of it in the form of financial assets such as stocks, bonds and cash. 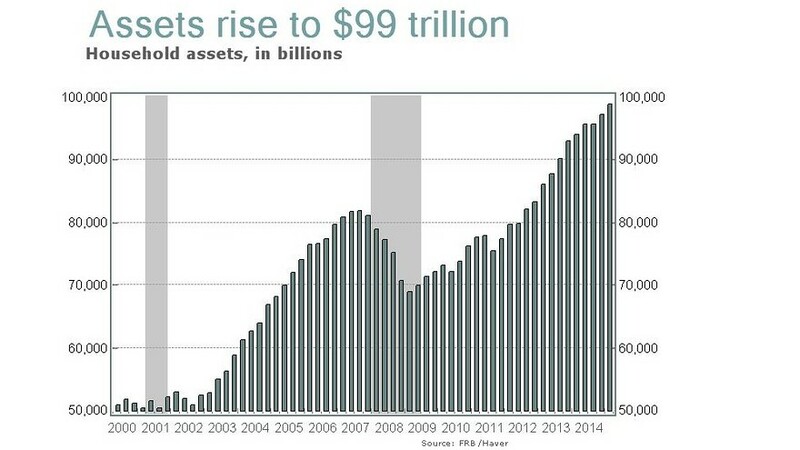 Compared with the nadir six years ago, the value of financial assets has increased by $24.3 trillion, or 54%. 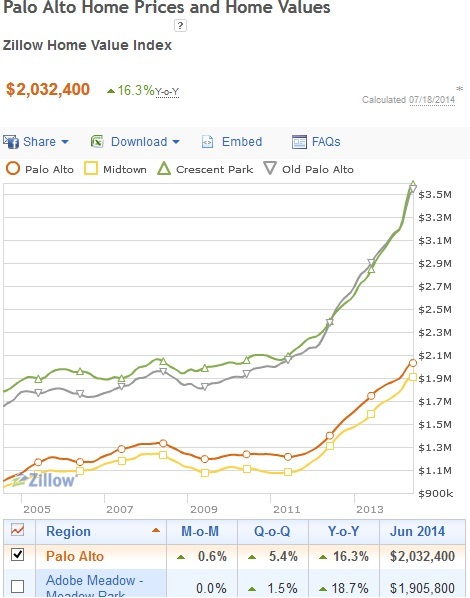 That’s the way you get rich in the smartist era – with stocks, Bay Area real estate, web 2.0…stuff like that. Overpaid, low-IQ, redundant salaried jobs are becoming obsolete, replaced by automation, temp-workers, outsourcing, or eliminated altogether. Due to the supply of labor vastly exceeding demand, employers not only have the luxury of choosing the cream of the crop out of a huge pool of applicants, but to save money and avoid bad PR, employers are becoming increasingly trigger-happy, thus no one’s job is safe. In using Facebook and Twitter, people are walking on eggshells, careers ruined at the slightest misstep. For many it’s too late, with Google indexing your transgressions as part of your online permanent record – an archive that is accessible to anyone with internet and a computer. That’s why online reputation management is such a rapidly growing industry, with individuals and businesses shelling out tens of thousands of dollars to bury their digital past. So while you have all this wealth and prosperity being created, it’s juxtaposed with record-high economic anxiety/uncertainty for millions of Americans. To quote Tyler Cowen, Average Is Over. To thrive in this hyper-competitive post-2008 economy, you can’t just be ‘good enough’ – you must be exceptional and indispensable. But it also helps to be a nerd, who are among the biggest winners of the post-2008 economy. That’s why you need to learn high-IQ skills, particularly STEM skills, that pay, but most people by virtue of the Bell Curve are probably not smart enough, and maybe that’s too bad, I guess, but your life may stink.